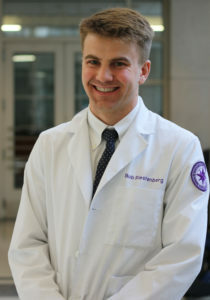 Robert Riestenberg, a third-year medical student, was the first author of a recent study published in the American Heart Journal. Compared to the general population, people living with HIV are at a significantly increased risk for cardiovascular disease. However, there has been limited research on the use of statin therapy — a common form of heart disease prevention — in this population. Robert Riestenberg, a third-year medical student, was the first author of a recent study that adds important new findings to the field. Analyzing data from a cohort of more than 5,000 people living with HIV and more than 10,000 uninfected control patients, Riestenberg and his co-authors discovered significant disparities in statin use among people living with HIV. The study, published in the American Heart Journal, was led by Riestenberg’s research mentor, Matthew Feinstein, ’11 MD, assistant professor of Medicine in the Division of Cardiology and of Preventive Medicine. In this Q&A, Riestenberg discusses the importance of mentorship, the study’s findings, and how he hopes the research leads to improved patient care. I majored in chemical engineering at the University of California, Berkeley, and my favorite class in the curriculum was fluid mechanics. A lot of the engineering concepts that I loved in college are important when thinking about how the cardiovascular system works mechanically. When I started learning about the cardiovascular system in medical school, I was fascinated. I put cardiology on the shortlist of potential specialties I would pursue down the road, and decided to look for research in the field of cardiology. Dr. Feinstein was my PBL small-group mentor during the cardiovascular module and was an exceptional group leader. He loves teaching, is enthusiastic when working with students and did a great job ensuring we understood the fundamental principles of each case we worked through. I remember Dr. Feinstein taking extra time to teach us how to interpret ECGs and determine the axis of depolarization of the heart. After the module, when giving feedback, Dr. Feinstein told me to contact him if I was interested in doing research in cardiology, and I knew it was an opportunity I couldn’t pass up. I met with Dr. Feinstein a few times to talk about ideas for projects and we decided to look into trends in statin use among persons living with HIV (PWH). Dr. Feinstein, Andrew Furman — another student who was working in a similar area of study — and I met with colleagues from the Northwestern Medicine Enterprise Data Warehouse, who helped us extract the necessary data from electronic health records. Over the next several months, we determined what analyses to run on the data, discussed the significance of our findings and worked on our paper. Dr. Feinstein also showed me how to use Stata, the statistical software we used in the study; he was a wonderful mentor, and I learned a lot as he guided me through the research process. We found that in our cohort of PWH and uninfected persons, a type of statin called pravastatin was roughly three times more commonly used in PWH on statins, compared to uninfected persons on statins. Conversely, simvastatin was roughly three times more commonly used in uninfected persons on statins, compared to PWH. Lipid-lowering effectiveness of statins was statistically similar between PWH and uninfected persons after statin initiation in statin-naive patients. In spite of this, black or Hispanic PWH with an indication for statin therapy were significantly less likely than white PWH with an indication for statin therapy to be prescribed a statin. Riestenberg, right, with classmate and co-author Andrew Furman, presented an earlier form of their research at an Area of Scholarly Concentration poster session in fall 2017. Statins have been widely shown to reduce mortality related to cardiovascular disease (CVD), and PWH have a 1.5-2 times increased lifetime risk of CVD (potentially due to changes in the immune system caused by HIV). Prior studies have shown that PWH with indications for statin therapy are under-prescribed statins relative to the general population, perhaps due to concerns over drug-drug interactions with complex antiretroviral therapy regimens or lack of time to address aspects of care other than HIV treatment. Therefore, there have been recent efforts to encourage providers to aggressively manage this risk with statin therapy. Our study shows that PWH are appropriately more likely to be prescribed pravastatin, which has a lower potential for drug-drug interactions. In addition, our study identifies racial and ethnic minority PWH as particularly susceptible to under-prescription of statin therapy when indicated. Although our study did not determine a cause for this under-prescription, we identified a need to screen and treat racial and ethnic minority PWH for CVD. Where does the research go from here? Additional studies are needed to further characterize the extent and causes of racial and ethnic discrepancies in statin prescription among PWH. Hopefully, this study highlights this need and will encourage providers to focus on CVD screening and prevention in this at-risk population. I am currently working with Dr. Sarah Kathleen Bandt and Dr. Nader Dahdaleh on research projects in neurosurgery, specifically, in the fields of surgical management of epilepsy and factors affecting outcomes in spine surgery.